Clay Smith collected 36 disposals in his return from a knee injury. The ‘Scray are back on the winner’s list after a narrow seven-point victory over Geelong at Victoria University Whitten Oval on Saturday morning. 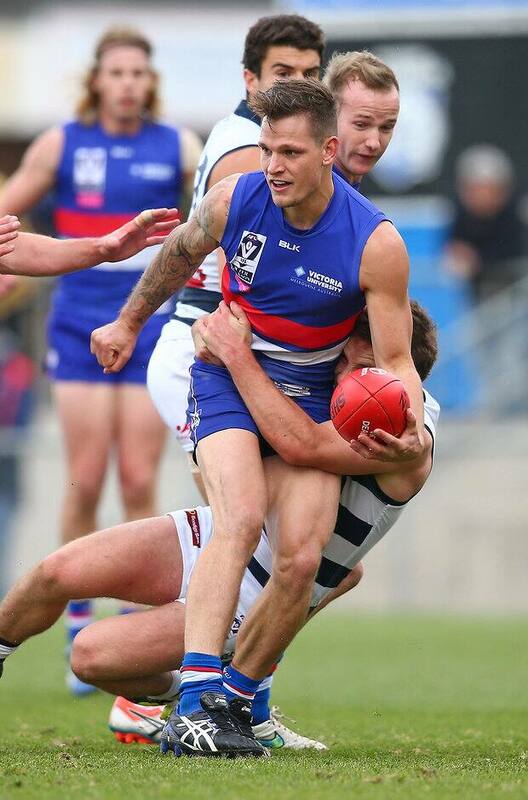 While the four points keep Footscray inside the VFL top-eight, the successful return of Clay Smith would have equally brought a smile to the Bulldogs faithful’s face. The match was Smith’s first game back since round six last season, and a return from a third ACL repair. Fans of the ‘Scray showed their support through loud applause with each of Smith’s 36 disposals for the day, as the number 14 put on a best-on-ground performance. His efforts impressed Coach Ashley Hansen who praised his dedication. “I asked for everyone to inspire one another, it’s a team game and Clay’s contribution today was just outstanding for a guy that’s missed so much football,” Hansen told westernbulldogs.com.au. “I think a lot of the credit has to our rehab staff who have prepared him really well to be able to come in and play a role for us. Footscray got off to a flying start against the tenth placed Cats, kicking three goals in the opening five minutes and going into the first break with a 25-point. Geelong rallied after quarter time, keeping the Bulldogs to just one goal in the second term but the Footscray defence matched the challenge and kept them to just one as well, preserving a lead of 27-points at the main break. “Certainly in the second quarter to kick 1.4 and not be able to capitalise on a really dominant inside fifty accumulation was disappointing and we tried to address that at half time,” Hansen said. Geelong challenged in the third quarter, kicking five goals to three as the weather began to turn with showers and gusty winds building that favoured the Barkly Street end. The final term was high pressure from both sides but the ‘Scray managed to hold on to the lead until the final siren despite a late charge from Geelong. “The last quarter we battled to move the ball out of our back half, we were kicking into a really strong breeze that kicked up in the last quarter which made it difficult but we had the character to hold on so which was really encouraging,” Hansen said. AFL listed key forward Tom Boyd also showed signs of growing confidence in his second game back from a shoulder injury. “He looked good in the ruck and gave us that second ruck option that’s providing plenty of flexibility and gets him in the contest,” Hansen said. “He’s two weeks back from injury playing in a key position in tough conditions so he’s coming along nicely. Footscray hit the road next week taking on Frankston next Saturday, June 19, 2:00pm at Frankston Oval.